Folks are asking about the two versions of the workbook, the 2009 and the 2010 version. They are nearly identical, so there is no need to purchase one of each. One major difference is the title change. The new title clarifies the struggles FOCUSED ON in the workbook. Most certainly, the bulk of the material in the workbook focuses on the issues and struggles common to depression, anger, codependency, substance abuse, bipolar disorder, and borderline personality disorder as the new title reflects. 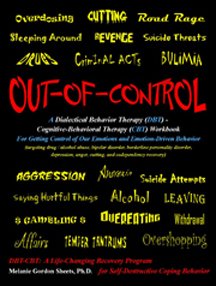 The cover of the workbook lists a variety of common destructive coping behaviors, “emotion-driven coping behaviors.” Some are frequently addressed in the workbook (revenge, suicide threats/attempts, aggression, saying hurtful things, overeating, and sleeping around) and some are not, like road rage, gambling, and anorexia. Given these are all driven by an out-of-control Emotional Mind, the skills, attitudes, and understandings taught in the workbook apply just the same. The new title was added to emphasize what the actual workbook text targets rather than what it applies to! Some changes were made to the back cover (design and text) and some minor text changes were made. If you are completing this workbook with a support group (or anyone else! ), it doesn’t matter if members have different versions. The text reads much the same and the pages are consistent across versions. Honestly, I’d buy the earlier version if the price was a lot cheaper! Otherwise, I’d go with the updated version.